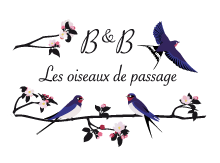 B & B « Les Oiseaux de Passage », delightful Guest House, in a character dwelling, located at Isigny-sur-Mer (Calvados, Lower Normandy), in the regional park of the Cotentin and Bessin marshes, in the Veys bay and in the direct vicinity of the D-Day landing beaches and memorial sites. 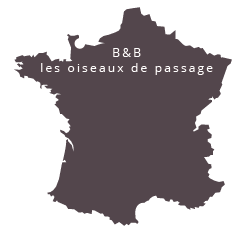 The three guest rooms offer a total capacity for eight guests and are located at Isigny-sur-Mer (Calvados, lower normandy). Spacious and comfortable, these guest rooms are decorated with authenticity and luxury. Each room is equipped with high-level technology : Flat screen TV set, DVD player, micro USB hi-fi, i-phones and i-pods dock, Wifi or Ethernet. Thus, you may listen to your own music and watch your holiday pictures. Easily accessible, the place is ideal for guests who wish to discover the numerous D-Day historic sites, the beautiful beaches and the rocky coast, a luxuriant natural setting, with landscapes and a light that were praised by French Impressionist painters. Moreover, our guest house is accessible to persons with disabilities (a label « Tourism and Disability »).